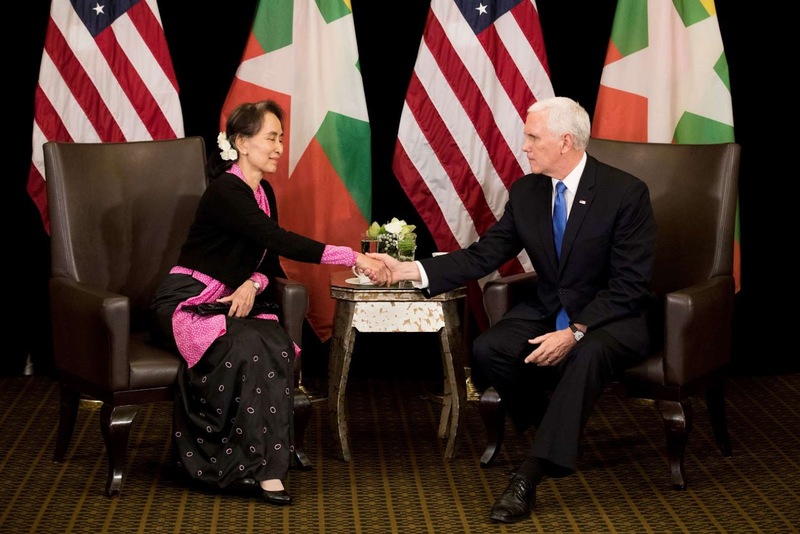 In a meeting on the sidelines of a regional summit in Singapore, Pence told Suu Kyi that he was anxious to hear about progress in resolving the crisis, which stems from a violent military crackdown in Myanmar's northern Rakhine state that the United Nations has called ethnic cleansing. He added that he was keen to hear about how Myanmar will enable the Rohingya to voluntary return home. Pence also said Myanmar's arrests and convictions of two Reuters journalists was "deeply troubling" to millions of Americans. "I look forward to speaking with you about the premium that we place on a free and independent press," he said. Though Suu Kyi has been the de facto head of Myanmar's civilian government since her party swept elections in 2015, she is limited in her control of the country by a constitution written under the former military junta. The military is in charge of security operations, including those in northern Rakhine. Myanmar's government and most of the nation's Buddhist majority say the members of the Muslim minority are "Bengalis" who migrated illegally from Bangladesh, and do not acknowledge the Rohingya as a local ethnic group even though they have lived in Myanmar for generations. U.N. officials have urged Bangladesh to move cautiously on plans to repatriate over 2,200 of the Rohingya refugees to Myanmar, saying such a move would endanger their lives.